Our route takes us through four states today--Tennessee, Kentucky, Illinois and Missouri. It’s a sunny warm day, and lots of farmers are out on their tractors, turning their fields to prepare for spring planting. We make two stops along the way in Kentucky--one ridiculous and one sublime. Our ridiculous stop is a short one at Keith Holt’s Hillbilly Garden, just off Interstate 24 heading into Sharpe, Kentucky. 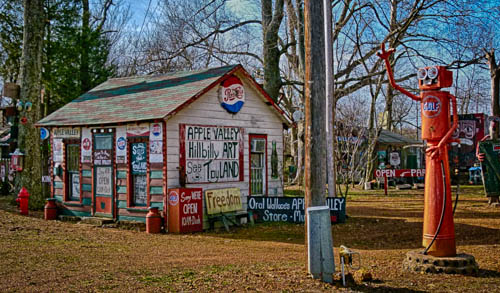 In fond remembrance of the glory days of Route 66, Holt set out to make his own roadside attraction on the site of his grandfather’s old gas station and cider stand. His Garden is intended to be an exhibit of junkyard art, but it is far more junkyard than art. We stop to take a photo of a row of half-buried lawnmowers, clearly a homage to Cadillac Ranch, and Holt himself dashes out to hand us a flyer and beg us to come back at 10, when he opens the indoor exhibit of over 3000 toys, and can give us a guided tour of the grounds. We practically burn rubber getting out of there. The sublime art is just up the road in Paducah at the National Quilt Museum. No photos are allowed, unfortunately. But, we spend a blissful hour and a half savoring the artistic expression, the colors and textures, the perfect stitches, the exquisite details and glorious embellishments of the quilts on display there. 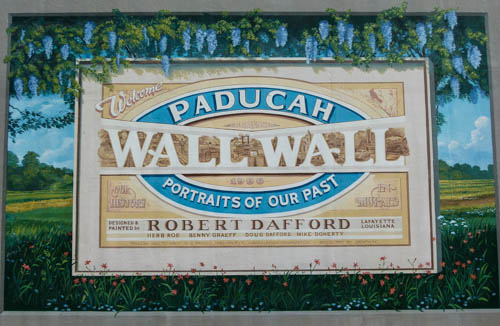 We walk around the charming downtown area, share a bulging sandwich at Kirchhoff’s Deli and Bakery, and admire the murals highlighting Paducah’s history painted all along the floodwall. 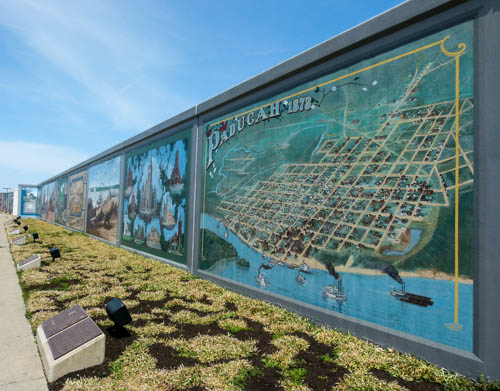 Billboards at the edge of town now welcome visitors to “Quilt City USA,” since the Quilt Museum is Paducah’s primary tourist attraction, drawing 40,000 visitors each year. 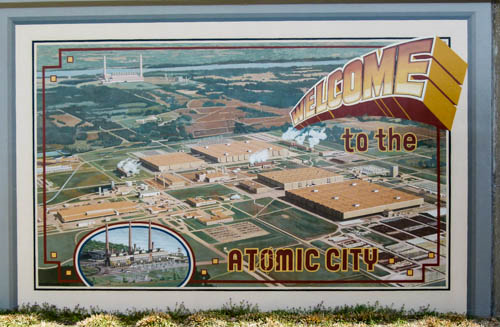 But, we learn at the floodwall that back in the 1950s, Paducah was known as “Atomic City” after it was chosen as the site of a uranium enrichment plant, and the resulting activity caused the town’s population to double. We could easily linger longer (fabric shopping at Hancock’s of Paducah could eat up a couple hours alone! 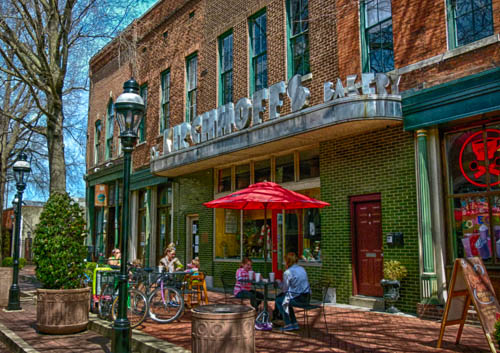 ), but we need to get some more miles under our tires, so we hit the road and make it to Columbia, Missouri by dinnertime. 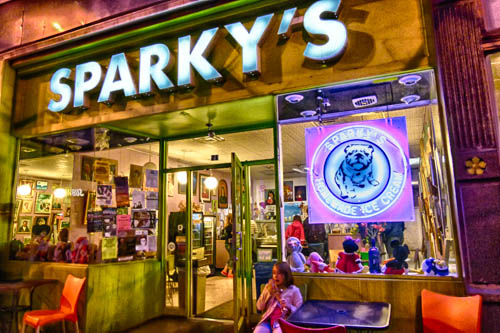 Just noshing on small plates at Room 38 lets us rationalize pigging out on homemade ice cream at Sparky’s, Columbia’s favorite ice cream shop. There are several flavors of ice cream that cannot be sold to anyone under age 21 due to their alcohol content, and lots of other interesting flavor combinations to choose from. The perky scooping staff encourages us to taste whatever sounds interesting (honey lavender--yum). The walls are covered with truly awful portraits that must have been reclaimed from the art department dumpster at nearby University of Missouri, but the ice cream is fine art, and that’s what counts. I guess we should add another state to our four state tally for the day--the state of bliss.